What is Dengue Fever? How is Dengue Fever Spread? Dengue fever is an infectious disease caused by a virus. The virus is injected into humans by the bite of an infective mosquito carrying the Dengue fever virus. In Saint Lucia Dengue fever is spread by the Aedes Aegypti mosquito. 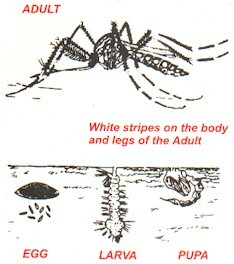 This mosquito has black and white strips on the body and breeds in any container containing clear water, e.g. coconut shells, old tires, drums, flower vases, etc. If you have those signs contact the nearest Health Center or Doctor. Yes. You can prevent Dengue fever by controlling the mosquito (Aedes Aegypti) population. The female adult mosquito lays its eggs just above the water line on the side of the container. When the eggs get into the water, they hatch into larvae or wigglers. The larva moves quickly around and after a few days develops into a pupa. The pupa is not active like the larva. The pupa develops into an adult after about tow days. Declare War on the Mosquito Today! How to get rid of the Aedes Aegypti Mosquito? Use soil instead of water in the flower vase. Cover water drums with fine mesh or cloth. Do not throw containers in open spaces or in your yard. Use appropriate garbage disposal facilities or bury these containers. Puncture tins before throwing away. Keep roof-gutter clear for free flow of water. Check flower vase containing water every two days for wrigglers. Puncture old tires in such a way so that they cannot hold water. For more information contact the Environmental Health Officer in your area or the Department of Environmental Health of the Ministry of Health.